Dallas defense attorney Rick Cohen guides you through the complexities of your legal defense. From your arrest onward he fights with skill to win your case. He fights to keep your criminal record clean, including non-disclosures and expunctions. Everyone makes judgment errors. If you have been arrested by mistake, or because of a judgment error you made, you need a legal defense attorney to help keep your record clean. As a defense attorney in Dallas, Texas, Rick Cohen defends legal cases for DWI, DUI, assault, drugs, theft, indecent exposure, sexual assault, fraud and traffic tickets—both misdemeanor and felony charges—plus others. He works as a defense lawyer all across Texas, including the North Texas counties of Dallas, Collin, Denton, Tarrant, Rockwall, Ellis, Johnson and Kaufman. You should call Rick Cohen now to get help with your legal defense. 972-233-4100. Friendly to you, Rick fights aggressively and skillfully to win your case. Rick works to help you get your life back. An arrest disrupts your daily life, making everything difficult. Having trouble with the law consumes your time and energy for days, weeks and months. Worse still, when handled incorrectly, an arrest and conviction can adversely impact your life for years. For some types of legal convictions—especially DWI—a unfavorable outcome can hassle you forever. With all of its negative possibilities, an arrest can understandably lead to fear and panic… Yet, it doesn’t have to be this way. You can trust the calm, kind and skilled guidance of Dallas defense attorney Rick Cohen. He understands people sometimes make judgment errors and get into trouble. When this happens to you, he carries the burden of your legal defense, so you can return to your regular life. While the burden of proving guilt is on the prosecution, an arrest makes you feel uncomfortable and awkward. Even if you have not committed a crime, an arrest can make you feel guilty. Yet—and this is very important—even if you feel guilty, even if you think you are guilty, you are presumed innocent, unless proven guilty. For all criminal charges, the prosecution must prove your guilt beyond a reasonable doubt. Even if the state shows your guilt as ‘more likely than not’ or as ‘clear and convincing,’ you are still not guilty under the law. The prosecutor must show your guilt beyond a reasonable doubt. In most cases, you should fight the charges to help protect your record. A negative legal record follows you around for years. A single conviction can prevent you from getting a loan, financial aid, government benefits, an education and a job, as examples. It can even cause you issues when purchasing something as common as mobile phone service. Because of this, even if you feel you are guilty, you should fight for your acquittal. Remember, if you have been arrested, Rick Cohen fights to keep your record clean. Rick Cohen gives you comforting, friendly and skillful legal representation. 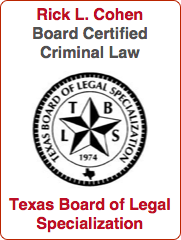 As a former prosecutor in Dallas County, Texas, he knows how to defend you against misdemeanor and felony charges. Good-natured to you, he focuses his tough skills on your case. You should call him today for help with your legal defense. 972-233-4100. Defense attorney Rick Cohen is a defense attorney for Dallas, Collin, Denton, Tarrant, Rockwall, Ellis, Johnson and Kaufman counties, plus all of Texas. He defends legal cases involving DWI, assault, drugs, theft, indecent exposure, sexual assault, fraud and traffic tickets, plus other types of charges. Rick protects your rights and works to keep your record clean, including non-disclosures and expunctions.